The Shuttleworth Collection's 2010 season of air displays began on Sunday 2 May, as typically the Spring weather decided to wreak havoc with the day. Morning rain led to the Collection wisely deciding to put the display timings back by an hour, and their brave decision was rewarded with a dry flying display, albeit one curtailed by the icy and gusting 20 knot winds, which kept many of the crowd favourites firmly in the hangar for the day. 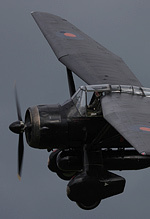 Dan O'Hagan and Steve Buckby report from Old Warden. Photos by the authors, and Ian Matthews. Of the aircraft which did manage to display, Plane Sailing's Consolidated PBY-5A Catalina and Peter Teichman's drop-dead-gorgeous Hawker Hurricane IIb flew straight in from their homes at Duxford and North Weald respectively. 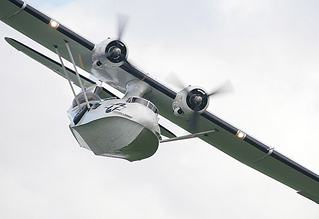 Even the mighty Catalina was visibly buffeted around during her graceful display. Other aircraft which braved the conditions included the Percival Provost, Blackburn B2, the de Havilland pair of Chipmunk and Tiger Moth, Avro Tutor and Hawker Tomtit. The Collection's Gloster Gladiator was especially impressive. The usual barnstorming was rather difficult for the pilots - the balloon bursting and ribbon cutting was challenging to say the least! The Twister Duo and glider act also made an appearance, again clearly struggling against the wind. Later in the afternoon the Hawker Sea Hurricane and Westland Lysander concluded the flying for the hardy souls who'd remained. Despite the wretched conditions the size of the crowd seemed healthy enough, and the venue's unique parking arrangement meant that many treated this as a "drive-in" airshow, preferring to sit in their cars and watch, to keep out of the chilly wind. Shuttleworth can count upon some of the most loyal supporters in aviation, and they'll have warmer days than this to enjoy as the summer unfolds!